Web PrintWeb Print enables printing from user-owned devices without the need to install printer drivers and manage server authentication. is a driver-less printing service that allows users to print by uploading documents from a web browser. No client software or driver installation is required. Your Web Print deployment can be scaled to meet the needs of your organization, removing bottlenecks and improving reliability. Web Print scaling through the use of multiple Web Print servers, increases throughput and minimizes users’ wait time for print jobs. Using multiple servers also provides resilience against possible network and server outages. With Web Print, users are authenticated when they log in to the PaperCut NG/MF User web interfaceThe User web interface provide a range of services for users, including a summary of usage and balance history, a list of the shared accounts that the user can use for printing, the current costs for printing usage, ability to add balance by using a TopUp/Pre-Paid Card or an external payment system (when using the payment gateway module), transfer funds to other users, view a history of balance transactions, view a list of the user's recent printing, and view print jobs pending release (when using a Release Station).. Any documents they upload can then be tracked against their user name and the selected shared accountA shared account is an account that is shared by multiple users. For example, in business, shared accounts can be used to track printing costs by business unit, project, or client. Organizations like legal firms, engineering firms, or accounting offices often have long lists of accounts, projects, clients, or matters. In a school or university, shared accounts can be used to track printing by departments, classes, or subjects.. Web Print is not available on direct print queues. To offer this service to your users, set up a server queue for this device/printer. Simple wizard style interface, accessed from any web browser. Users authenticate with their regular (network / domain) logins. 100% web based. No drivers, client software, or browser plugins required. File uploads with progress indicator. Supports popular document formats including PDF, DOC/DOCX (and other Microsoft Office Word formats), XLS/XLSX (and other Microsoft Office Excel Formats), PPT/PPTX (and other Microsoft Office PowerPoint formats) and Microsoft XPS (XML Paper Specification). Web Print also supports common image formats including JPG, GIF, PNG, TIFF and BMP. Users select printers from an auto-generated list or a clickable printer map, which you can design or import using open standards and free software. You can use Web Print in one of two possible modes: . Default Mode—involves running the Web Print software on the same system as the PaperCut NG/MF Application ServerAn Application Server is the primary server program responsible for providing the PaperCut user interface, storing data, and providing services to users. 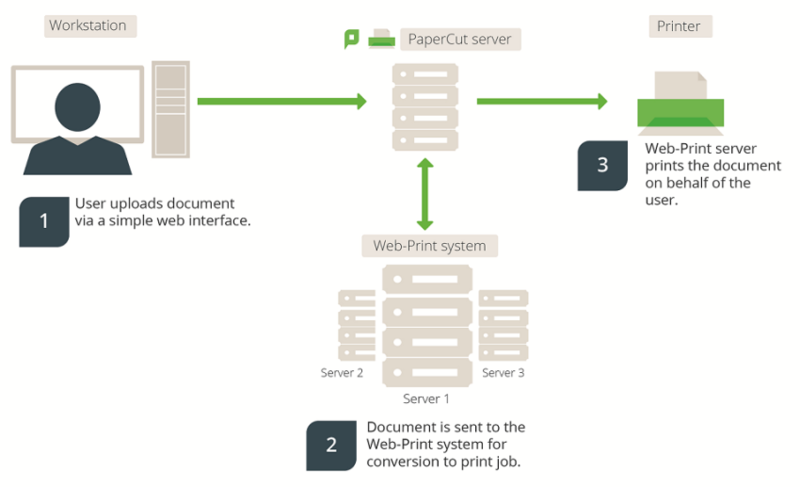 PaperCut uses the Application Server to manage user and account information, manage printers, calculate print costs, provide a web browser interface to administrators and end users, and much more.. On Windows, it runs as a Service. This is the fastest and easiest way to get Web Print working. However, only printing of PDF documents (and picture files on Windows) is supported in this mode. See Set up Web Print: Default mode). Sandbox Mode—uses a sandboxed or virtualized system, isolated and dedicated to the task of processing Web Print jobs or converting documents for Email to PrintEmail to Print allows any device to print documents by sending an email to your network's print devices.. Sandbox Mode takes a little more time to configure, but offers several advantages, including improved security, higher throughput, and more supported document formats. This mode accepts popular file formats and converts them to print jobs using common external applications. This is done by orchestrating applications such as Adobe Reader TM, Microsoft Office TM, and the Microsoft XPS Viewer as background server-side tasks. See Set up Web Print: Sandbox mode . Adobe Reader, Microsoft Office and XPS Viewer are not supplied with PaperCut. It is your responsibility to purchase and conform to the licensing requirements of any third party software. The following table lists the supported document types and associated applications that Web Print can use to render and print jobs. Before some file formats can be accepted as an upload, you must install its supporting application. Direct PrintingDirect Printing allows you to print directly from a desktop to a printer, without the need for a print server. Microsoft XPS XPS External application required Microsoft XPS Standalone Viewer (Essentials Pack) - For more information see Installing XPS Viewer. * Picture files are not supported for Mac and Linux Application Servers. If you have Acrobat installed on the Web Print server, when users print multiple copies of PDF files, each copy is processed as a separate print job. To reduce the server and network load, we recommend uninstalling Acrobat and using Xpdf, which is the default PDF viewer. Before setting up Web Print it is worth considering any security implications. Because Web Print allows any user with access to the PaperCut NG/MF user web interface the ability to upload a document for printing, it naturally increases surface area for attack. More specifically, security vulnerabilities that might usually be considered local, because they are triggered by opening a document in a Microsoft Office application or Adobe Reader can become a remote vulnerability. This is because these same applications are used to render print jobs on the server after the user has uploaded their document. You can mitigate much of the security risk through security best practice, such as regularly applying security updates to the orchestrated applications. Organizations that are very security conscious might consider the sandbox approach. Sandboxing the Web Print server provides an extra layer of protection/isolation.